We left Warsaw for Krakow under the impression it would take about 4 hours to drive. What we hadn’t factored in was how bad the Polish traffic is. I honestly did not expect for there to be gridlock at all hours of the day, but there was! 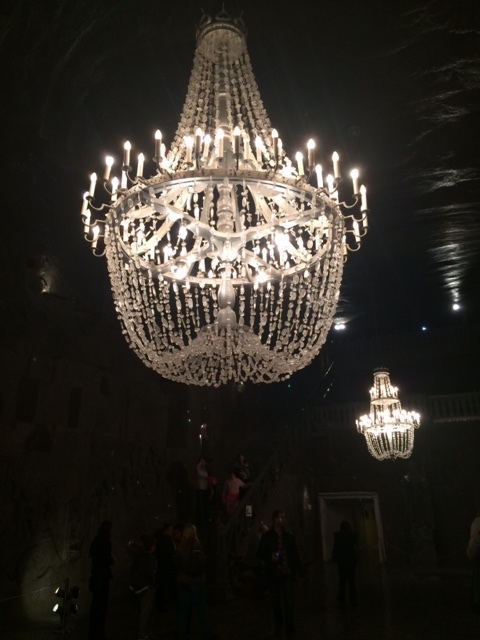 It took us forever to actually get out of Warsaw which was around 10:30am but we were confident we would get to the Wieliczka Salt Mine in Krakow around 4:15, for the last tour that ran at 5pm. Once again, the roads were challenging (very few motorways in this part of Europe!) and when we reached the outskirts of Krakow at 4:00pm we were confident we would make the tour. That confidence will get you! We suddenly hit traffic that makes Brisbane peak hour seem like a day at Disneyland. I was driving and it was stop, start and putting Scarlett in to first gear is not a pleasant task. We made the Salt Mine at 5:02pm. What should have been a 15 minute trip, took an hour, and we missed the last tour. 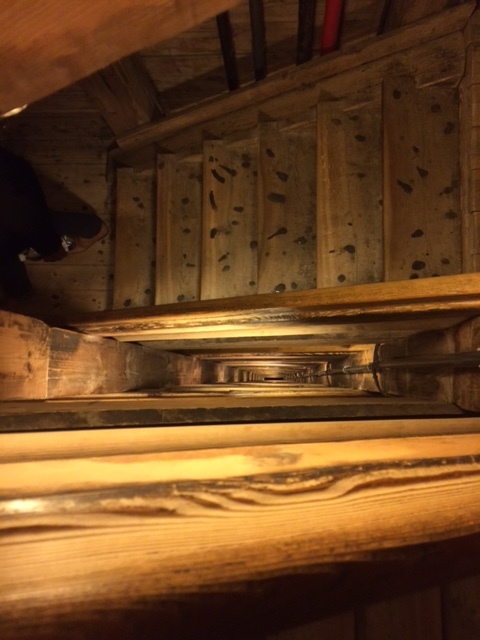 We instead went up the Graduation Tower for a look around, wondered what the point of it was, and decided we would come back for the tour on Friday morning. Once again, being the shoulder season a few campsites were closed and our options on where to stay were limited. We chose Camping Smok and regretted it. The lady was icy, it was basically her backyard and they had shut the amenities block for the season so we only had a creepy toilet to use, and the two showers available were only open until 8pm. Of course the WIFI was dodgy and we had to pay full price for the muddy site with limited amenities. She only took cash and we were the equivalent of $3 short and asked if we could get her the extra money in the morning. She wasn’t too happy about it and took Brad’s license as a guarantee. If it wasn’t late in the day and if we hadn’t been crazy tired from all of the traffic, we would have driven out of there. Seriously, how rude. 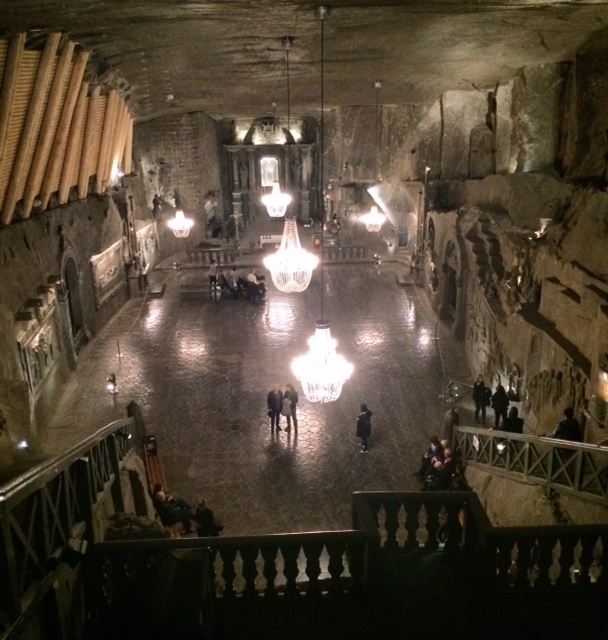 On Friday we did make it to the Salt Mine and it was really interesting! It was the most tourists we have seen and the woman taking the tour was professional and informative. The 2.5 hours went really quickly. Even though the mine is no longer in commission, they produce 10 000 tonnes of salt a year to maintain it by extracting the brine water. The air down there is 10 x saltier than regular air, and they mentioned a few times how good it is for your health and can assist with respiratory problems. You can also pay to go to their wellness centre, and breathe in salty air for 8 hours. I’d rather just go home and visit my parents and get the same results from fresh sea air (plus have my washing done and meals provided)! The mine was spectacular though and the chapel and sculptures that are purely carved out of salt were worth seeing. Walking down 60 flights of stairs! The Catholic Chapel carved out of salt. 125m underground. The tour finished around 1:30pm at which time we were STARVING. We took a taxi in to the Old Town and had a late lunch. I had the best steak I’ve had in a long time with vegetables and Brad had veal knuckle which was also tasty. After a few hours wandering, we ordered an Uber to go back to camp. Our driver was excellent! He was a young Polish man who spoke fluent English and could not believe we had travelled all the way from Australia. He also asked us if it was okay if he drove the wrong way down a one-way street as it was save the three of us 40 minutes of sitting in traffic. We said that was perfectly okay and were grateful for the time saving! On Saturday morning we left Krakow for a visit to the Auschwitz-Birkenau Concentration Camp. It was a 1 hour 15 minute drive and as we got close to the camp, we got stuck in more traffic and it took us an hour to to do that remaining 15 minutes. We arrived eventually and saw the only English tour left was at 2pm and it had one space. When we arrived I got a weird vibe from the place. It was incredibly busy and crowded with tourists. Back in 2014 I visited Mauthausen Concentration Camp in Austria and it was an incredibly humbling and moving experience. It was a privilege to pay my respects to the people who had been so brutally treated, and murdered during the Holocaust. I told Brad my concerns but he wanted to take the tour, so we waited the two hours and had a friendly ticket woman that snuck us both on to the tour. From that moment everyone in the group, about 20 of us, weren’t very impressed but we still wanted to learn more about the history of the place and pay our respects. The tour went from bad to worse, he didn’t present the facts in a respectful way and kept using the words “extermination” and “the Germans”. It also really bothered me that so many tourists were taking photos. There were horrific exhibitions of peoples hair that had been shaved off them, shoes and belongings, as well as the gas chamber where so many innocent Jews died, and people were taking pictures. I felt sick. I’m not sure If I’m overreacting here but I just don’t see the need to photograph these things and I think it’s disrespectful. What are your thoughts? An American couple also asked a few questions of the guide and he blew them off. Half way through the tour, everyone left. He had successfully made us all feel disgusting and we didn’t finish the tour. A huge disappointment and I’ve emailed the Museum the feedback. After Auschwitz we headed to Wroclaw to spend the night, before making it back to Berlin on Sunday. Here we stayed in another campsite that was someone’s back yard, it was muddy, and the showers and toilets were portable ones that were dirty and the hot water was only on for two hours a night and the WIFI didn’t work. $38 NOT well spent. Poland is a country worth visiting, but perhaps stay in hotels and use public transport! Next stop: Back to Berlin! So interested in your post, Britt, as I have always wanted to go to Poland and to Auschwiiz. i’ve been to Sachsenhausen near Berlin and also to Dachau. When my daughter and I were in Gallipoli recently, she made the same comment as you about taking photos. There were people (not with our group) who had selfie sticks which I thought was terrible! I think if you take photos in as respectful a way as possible, then I guess it’s OK. I took photos of the ‘arbeit macht frei’ gate at Sachsenhausen and the barbed wire and the assembly yard along with some of the memorials at the site. At Gallipoli I tried to capture the peacefulness of the resting place of the soldiers and I did have one photo of myself taken at ANZAC Cove as I just couldn’t believe that I was standing where the soldiers had landed. So sorry your guide was rude. That would really upset me after having wanted to go there for so long! We loved Berlin so I hope you have a better time there (again) when you get back.